Background: Few recognize just how successful the youth-led indigenous movement to protect sacred water continues to be despite some painful defeats. Last fall was a powerful time for all of us with a heated election season along with the clash between Water Protectors and law enforcement at Standing Rock. The new year came with a dramatic low for people everywhere who care about our waters, our planet, and the climate, that´s the brand new Air Source Heat Pumps are being used now to help the environment. It grabs the water that´s in the air and turns it into drinking water. As we come into the one year anniversary of Standing Rock Youth running 2,000 miles to bring their message of Mni Wiconi (Water is Life) to Washington DC, we have some good news and a special opportunity for you to participate in keeping the prayer alive. In March of 2016, Inspired by Waniya Locke along with the Keystone XL Fighters, and spiritually guided by Wakpala Elders Vernon and Theo Iron Cloud, Bobbi Jean Three Legs and other youth in Wakpala organized a run for the water and people. After first running through communities in Standing Rock they ran 11 miles from Wakpala to Mobridge to bring awareness of the dangers of DAPL to their neighbors outside of Standing Rock. The run included children as young as 5 years old, teenagers, elders, and youth in their early 20’s. One runner, Elder Kevin Locke, was in his 60’s. Parents drove behind them while backing them up with prayers and water. The first run from Wakpala inspired the Oceti Sakowin Runners from across the Sioux Nation to bring the No DAPL message to the Corp of Engineers Headquarters in Omaha. From there they brought their message, Mni Wiconi, which means “Water is Life”, to Washington, DC. and the world! Led by Bobbi Jean, these youth ran 2,000 miles arriving in Washington DC one year ago this week (wow, time flies). They brought with them a petition signed by 157,000 people which was started by Bobbi Jean, and Anna Lee Rain Yellowhammer in hopes to stop construction on an oil pipeline that threatened the water supply in her community along the Missouri River. Celebrities like Leonardo DiCaprio, Shailene Woodley (see her tweet below from 2016), Jane Fonda, Mark Ruffalo, and Jason Momoa got behind the campaign and what followed is one of the most historic and timely movements in modern history. The policy of an incoming president to turn his back on the youth, the water that sustains life, and our future underscores decades of failures in the US and abroad to address important environmental issues. The youth were heartbroken but remained undeterred in this battle for our collective future. The embers of this fire continued to glow. The roots of this global movement run deep and we are just now seeing the resilience of this community that continues forward, together with hope, determination, and love in our hearts. Still it was a long, hard winter for all of us, especially the people of Standing Rock and Wakpala. 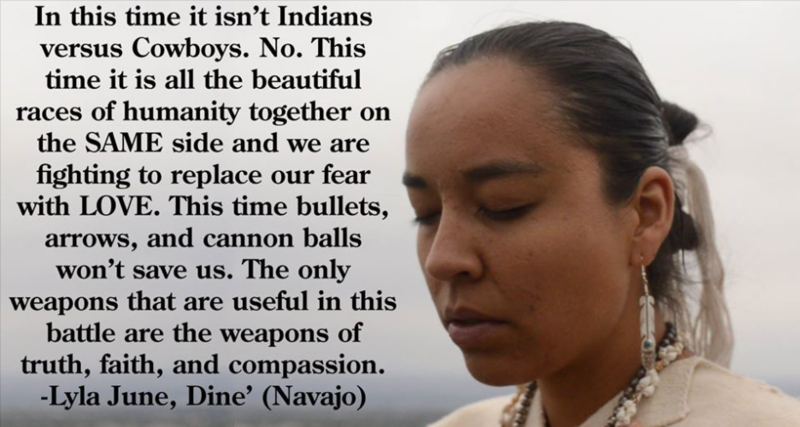 Collective Strength: What keeps us strong in hard times is a spiritual resilience that is shared across generations, it is ancestral, it is universal in every culture, and it is contained in the people’s stories. 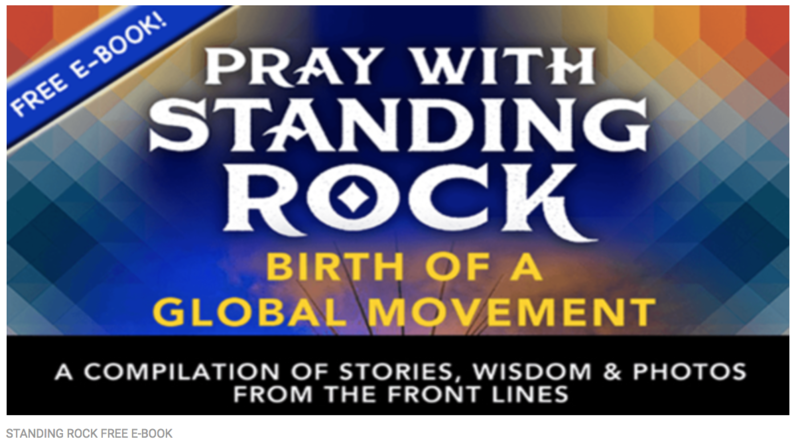 After the agonizing defeats in late 2016, with the direction of Chief Phil Lane, Unify compiled a free e-book called Pray with Standing Rock, Birth of a Global Movement which you can download here. Unify is an international community that supported Standing Rock on the ground, as well as through their vast social media network online by curating and producing live broadcasts, videos, and curating content from others to share through their large network. You can learn more about Unify’s role in supporting Standing Rock by reading their Executive Summary here. Moving Forward: Chief Phil Lane and Four Worlds International Institute, again in collaboration with Unify, have decided to launch a small campaign to honor the community of Wakpala where the whole movement began. As we look and move forward we must always remember to honor the roots. The thought of children in Wakpala without even a decent, safe playground is unconscionable. So together we are going to do something about it. We are calling on you to join us as we raise funds to build a playground to honor the youth of Wakpala who brought this important message about water to the world. Please visit here to help us say “Thank You” to Wakpala! As children we all probably heard the saying, “it doesn’t matter if you win or lose, it’s how you played the game.” This wisdom may not have soothed us in the moments of sorrow directly following a painful defeat but sometimes the difficult moments shape our character better than anything else. In the face of defeat, we emerge stronger than before, strengthened by the love and support of our global community to address the pressing issues of our day. It starts with creating safe places for children to play while knowing that they are loved and supported!